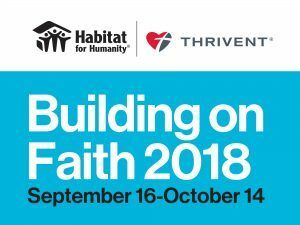 You’re invited to join us during Thrivent Financial’s Building on Faith Month – September 15 through October 13. During this month Habitat for Humanity in Monmouth County and Thrivent Financial will host build days on four ramp sites throughout Monmouth County and workshops at our ReStore in Freehold. Building on Faith Month is supported by the Thrivent Member Network–Northeast Region. A Thrivent Member Network is a regional group of Thrivent members committed to supporting The Thrivent Way. Members have access to resources to help create wise financial strategies and make the most of their time, talents and treasures. Thrivent Financial and Habitat for Humanity strive to serve and strengthen families and communities, locally and around the world. United by this common goal in 2005, we began the amazing Thrivent Builds with Habitat for Humanity partnership. Since that time, Thrivent and our members have contributed more than $226 million and 5 million volunteer hours to join with local Habitat offices and host communities to help build or repair safe, affordable homes with families in need of decent shelter. For more information please contact Sharon Newberry at snewberry@habitatmonmouth.org or 732-728-0441 x. 310. Next PostHelp Fund our Forklift and Truck!